“Batu Pahat— In the dusk, at the foot of the jungle-clad hills near this Malayan coastal town, a middle aged man, pipe in mouth, can sometimes be seen walking slowly through the waist-high undergrowth. Mathews house was just outside then main gate of the camp – on Turner’s visit several of the camp buildings were still standing. ‘His place became ‘open house’ to the Diggers. An AIF doctor attended one of Mr Mathews’ children when she was sick; an AIF padre christened another … He had Christmas dinner 1941 with the Australians. Many of the men he sat joking with around the mess table were dead a few weeks later. ‘Poor old Mick O’Hara … fine fellow … was always at my place .. died while a prisoner in Japan, I think. ‘And the doctor, Captain Hazelton … he came out in the middle of the night to attend my sick daughter… good of him. Wonder where HE ended up? ‘Then there was Staff-Sergeant Mortimer and a chap named Nathan. We had some wonderful times together. Could you find out if they ever got back to Australia? … Mr Mathews takes a bundle of letters from his pocket. I note down the names of some of the Diggers to whom he had written letters he never posted. George Aspinall was the ‘Changi Photographer.’ Aspinall recounts in Tim Bowden’s terrific book Changi Photographer (George Aspinall’s Record of Captivity 1984) how while the 2/30th were at Birdwood Camp he used to visit Wong Yeow’s photographic shop in Changi village and learned to process his own film. After the war it was named the George Camera Shop and was still there when I visited in the late 1990s. Aspinall’s skills later enabled him to take and print his extraordinary images of captivity at Changi and on the Thai Burma Railway. Aspinall scrounged some x-ray film and chemicals while working around Singapore, before working on the railway from April to November 1943. He survived, and died in 1991. Aspinall also took a number of photographs of his comrades at Batu Pahat, before they were made prisoner. This one is of 13 members of D Company, 2/3o Battalion. Aspinall is standing on the far right. 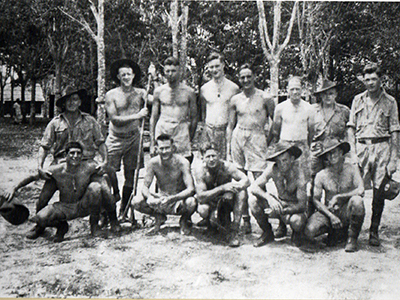 George Choat (second from left, standing) was killed in action on 15 January 1942 and is remembered on the Singapore Memorial. Allan Ray Cox (fifth from left standing) died on the railway and is buried at Thanbyuzayat in Burma. Norman Sydney Grist (front row, far left) died at Ranau on 10 July 1945, Borneo after the death march Sandakan and is remembered on then Labuan Memorial. He was too ill to attempt the escape from Ranau – six escapees survived of 2434 prisoners at Sandakan. Jim Baird (third from left front row) died when the Rakuyo Maru was torpedoed by USS Sealion 12 September 1944, en route from Singapore to Japan. It carried no Red Cross markings -1159 POWs died. Nathan was one of six 2/10 Field Regiment who were in F Force sent to work on the Thai-Burma Railway from Changi in April 1943. There were 7000 men in F Force – 3600 British and 3400 Australian allegedly moving to a place where food was more plentiful than in Changi – a holiday camp. Instead their destination was the Thai Burma Railway. Within eight months nearly 50 per cent were dead. On 9 September Castle wrote ‘Beri Beri has reached heart so if I don’t get vitamins soon will not need them.’ Chris Nathan lay in that ward or another nearby on that day, 9 September 1943 He died, Castle survived. Chris Nathan is buried at Thanbyuzayat War Cemetery, south of Moulmein in Burma. Of the 834 officers and men of the 2/10 Field Regiment who became prisoners, 270 died. George Blues was one of 14 2/10 FA sent from Singapore to Japan as part of the C Force, arriving on 7 December 1942. He was in the group that went to Kobe where they were forced to work in the Kawasaki shipyards – and were starved and suffered innumerable beatings from Japanese and Korean guards. and WOII Joseph ‘Till” Tosi NX 51987 were also sent to Japan after working on the railway, in A Force. They are all buried in the Yokohama War Cemetery. Sergeant Mortimer was one of over 2000 Allied prisoners of war held in the Sandakan POW camp in north Borneo, having been transferred there from Singapore as a part of B Force. The 1494 POW’s that made up B Force, were transported from Changi on 7 July 1942 on board the tramp ship Ubi Maru, arriving in Sandakan Harbour on 18 July 1942. 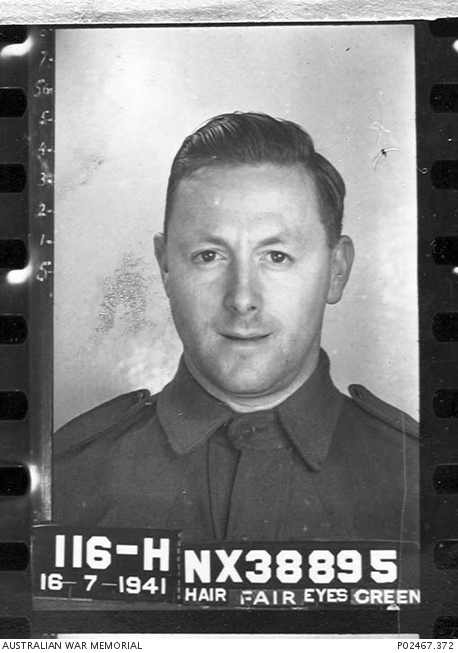 Sergeant Mortimer, aged 47, died as a prisoner of the Japanese on 17 February 1945 at Sandakan. He was the son of Henry Walter and Emily Jane Mortimer, and the husband of Veronica Beatrice Mortimer, of Lakemba, NSW. He is remembered on the Labuan Memorial. Captain (later Major) Alan Richard Hazelton, of C Company, 2/10 Field Ambulance, was the Senior Medical Officer for ‘D Force’ in camps along the Burma-Thai railway and at Nakom Pathom Base Camp in Thailand. Hazelton was born in Sydney in November 1915 and enlisted in the Medical Corps on 25 July 1940. Hazelton survived and returned to Australia after the war. 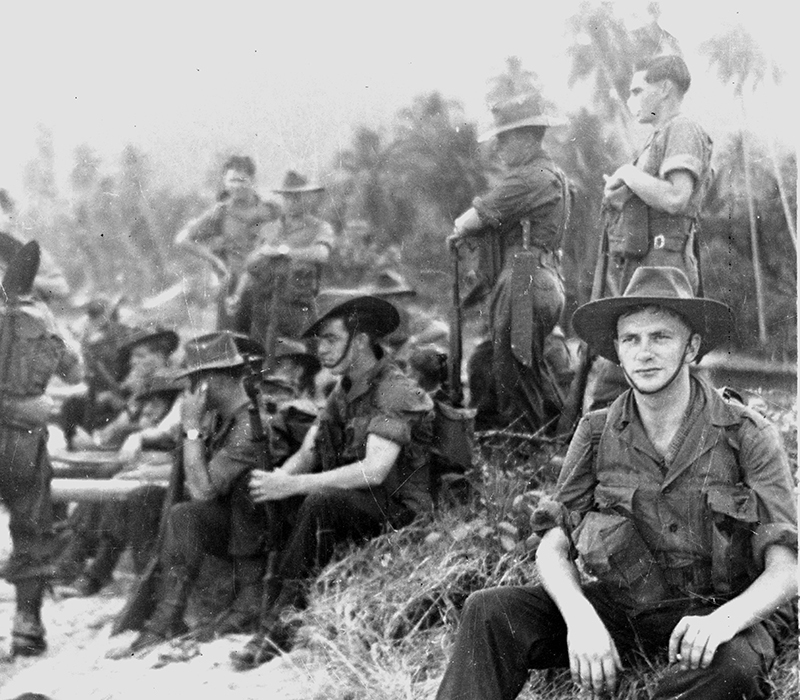 Private Michael Thomas O’Hara was sent to Sandakan in B Force in July 1942. Private O’Hara, aged 34, died on 29 May 1945. He was the son of Charles Andrew and Margaret O’Hara, of Mayfield, NSW. On 29 May 536 prisoners were sent on the second march to Ranau; 288 sick were left behind. (Lynette Ramsay Silver, Sandakan: A Conspiracy of Silence 1998) We don’t know whether Mick died on the march or at the camp: Lynette Silver, after her exhaustive enquires into the Sandakan tragedy, has his death date as ‘presumed’ to be on 29 May. He is remembered on the Labuan Memorial. The three pals were Privates Frank Deans, Hugh Stone and Bren Leahy. Private Francis Davidson Deans NX 38917 Malaya 2/10 Field Ambulance. 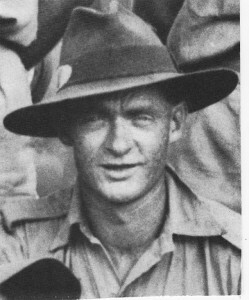 Frank Deans, born in 1908, was a Sydney police constable who enlisted on 10 July 1941 and survived Changi and F Force on the Thai Burma Railway. Wal Buckley (NX 46754 in Medical Doctors p 254) tells a story about Frank Dean and his ‘territory yarns’. ‘I camped at Tambaya one night and there were a lot of Pommies listening intently and Frank, knowing this, said if any of you British boys are contemplating emigrating to Australia, there’s one thing to be wary of. Yeah Frank, what’s that? Just don’t annoy those Artesian Bores. WhenPrivate Brendon Timothy Joseph Leahy NX36161 was paraded before Major Hazelton the incriminating beer bottles had disappeared. After the incident he was known as Torchy Leahy. He also survived the war. Private Hugh Dalrymple Stone NX2710 was part of B Force and died at Sandakan on 12 May 1945. He is remembered on the Labuan Memorial. His father also WOII Hugh Dalrymple Stone (1887-1947) was a Gallipoli veteran (17th Battalion) and served with the 14th Light Horse in Palestine. He re-enlisted in 1940-2 for home service. In February 1956 Mrs Little of Dandenong wrote to Turner, ‘ I have read with great interest your article … My friend Mick O’Hara died a p.o.w. but I would like to contact Mr Mathews – would it be possible to write to him. I wonder whether Uncle Laurence replied. Wow, Michael Mathews was my grandfather! We had just been talking in our family about this article and wondering if it was in an Australian newspaper (to get a copy) and when my sister looked up the author we discovered this article. George ‘Slim’ Dunne was my great Uncle who was a POW and died there. Very little was ever known and the information above, though small, has still given me an indepth insight of what our countrymen had endured for me and for the rest of Australia. It is an absolute Honour to be Uncle Slim’s great niece, although I never knew him, I’m still greatly honored for what he and so many others gave up for us…. I am proud to say George Haldane Blues was my father. He married my mother in December 1945 – moved to Bathurst NSW. Had three children, 2 daughters and 1 son. Lived a very happy life. He died aged 61 after a massive heart attack and suffered mental problems. He never talked about his war experiences, but always instilled in us to forgive others. Also, to treat others as you would have them treat you. An amazingly strong and beautiful person. May he always rest in peace. Helen James on behalf of our family. Both my father, Percival Thomas Buckley (NX46300) and my uncle Walter Buckley (NX46754) were members of the 2/10 field ambulance and were both captured when Singapore fell. They spent time in Changi (The Ritz according to my Dad) then were sent up to build the railway. We only ever heard a few humorous stories and don’t exactly know what happened to the pair but they both survived (probably not the correct word) I am looking for any official documents or books that may give us details of where they were sent and how they got back. We have a book by Ray Connolly & Bob Wilson “Medical Soldiers” 2/10 Australian Field Ambulance 8 Div. 1940-45. Published in 1985 and my uncle Wal has contributed a story. I hope the sacrifices and suffering of these men and women are never forgotten or taken for granted. Does anyone know exactly what happened and where he might be buried – Edwin Money Goodrick 8th Division 2/10 Field Ambulance , a POW captured by the Japanese and executed at Jambi. Husband of Anne Goodrick, of Black Heath, New South Wales, Australia. I’ve now had time to look again at the history ion the 2/10th FA – ‘Medical Soldiers’ published in 1985. Perhaps you have already looked – I can’t find any details except that he is listed as Missing … are there any details in his service record?